Pin the tail on the kitty. Her body lay on the metal table in the veterinarian’s office, still. It was in some ways just the same body it had been two hours earlier when she had been alive, expected to keep living. No rot or smell had set in. They had laid her on her left side to hide the wound on her face where they had cut out the growth, where the incision would now never heal. I stroked her white fur, took a last look at the unusual markings that made her a caliby van—a calico tabby with color on only her head and tail. “Pin the tail on the kitty,” one of my old boyfriends had said every time he saw her. Her fur was still soft and clean. It still came out in wisps and stuck to my shirt as I ran my hands down her dead body. 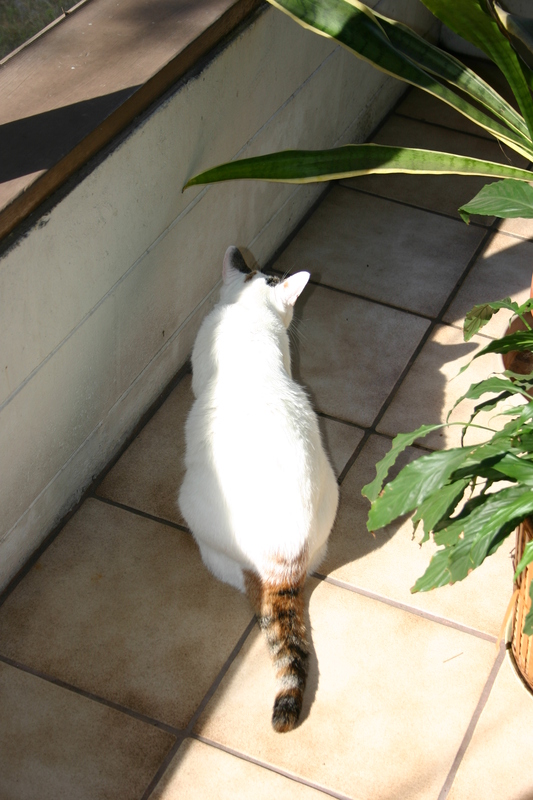 I had been present at the euthanasia of three of my cats, and I prided myself on being there with them til the end. I couldn’t understand people who dropped them off and left before the deed was done. With Cassie I had waited too long—until she fell down the basement steps trying to get to the litter box. With Stella I had done it too soon because I was headed out of town and couldn’t leave the task in the hands of someone else. With Zelka I thought I had gotten it just right—while she was still beautiful but unable to eat, her throat blocked by metastases. Maya’s decline had been different. Just ten days before she died, I’d come home from the hospital and curled up in bed with her. She let me know that my absence had been worse for her than it had been for me. She meowed and meowed. She poked her wrinkled nose into my side and raised her back leg for a belly rub. She chewed at the bare spot on her forearm. Months earlier, Maya scrambled under the bed or behind the bookcase every morning when it was time for her insulin injection. She was the second cat I’d had to develop diabetes, and my veterinarians were the only people ever to be delighted that I, too, have the disease. They didn’t have to tell me what the implications were of refusing to treat it, and I had the tools on hand. I knew how to give shots. The first cat had been easy, but Maya screamed as though I might kill her. She ran, her claws scrambling across the tiles, like a cartoon cat. Every single time. Her care became an ordeal. But I would not put her down, one diabetic asserting that another was too much trouble. Instead, she came out of the diabetes, as cats often do. I found her on the floor of the living room, limp with insulin overdose. She tried to meow, but only a squeak came out. She could barely blink her eyes. I grabbed the honey bear from the kitchen and tried to spread some on her tongue, but she gagged. Ground-up glucose tablet diluted with water and shot down her throat via syringe worked better. It occurred to me that something else was wrong—maybe a stroke—but I kept hoping it was the obvious. I lifted her up to my lap on the sofa and waited. Her body draped over my legs, a dead weight, but then her tail twitched. She came back to life, as I have myself after so many low blood sugars. Posted in Pets & Animals. Bookmark the permalink.